Hospitals were at the forefront of discussion as council approved community grant requests over $5,000 on Tuesday evening following a sometimes heated debate. With 18 requests totalling $512,797 and only $291,763 budgeted for grants in 2018, several councillors admitted there were some tough decisions to make. Many noted that all of the asks were worthy of support, but some had to be trimmed while others were denied. In the end, council approved 13 requests totalling $285,800 in a recorded vote of 9–5 with councillors Brad Nieman, Dianne O’Brien, Roy Pennell, David Harrison, and Janice Maynard voting in opposition. Council embarked on a new process to approve the grants this year, first setting an amount during budget deliberations in December before making the final decisions on which applications to support on Tuesday. The new process seemed to create some confusion and frustration as council took informal votes to see which grants would move further along in the discussion. 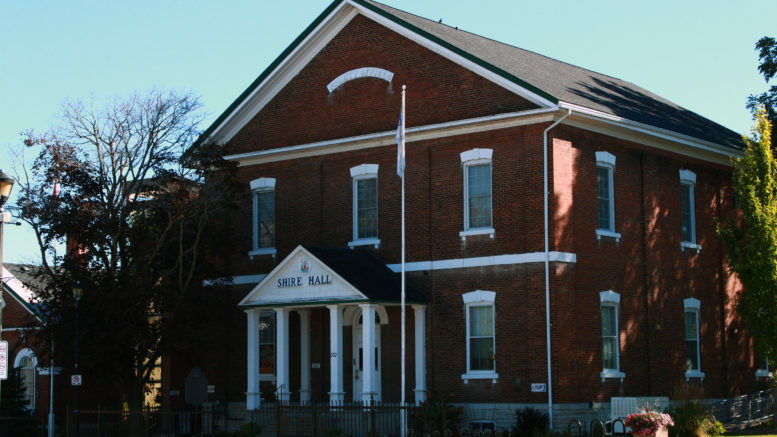 As the process got underway, it became clear there were some requests several councillors believed should have been line items in the County budget and shouldn’t be part of the discussion. Chief administrative officer James Hepburn advised the budget had already been set. While the items could be considered as part of the budget as a whole next year, it was too late to do so this year. A $60,000-grant for Glenwood Cemetery and a $12,000-ask for the Wellington Cemetery were quickly approved as council agreed there were few other options. They hit another stumbling block when it came to a $75,000-request from the Prince Edward Memorial Hospital Foundation. Councillors had just heard from hospital foundation chair Monica Alyea, who said Minister of Health and Long Term Care Dr. Eric Hoskins recently announced approval of the first stage of a capital project for a new hospital along with a $500,000-grant toward planning expenses. The announcement meant the foundation’s fundraising efforts for the community’s $12.7-million share of the project needed to be ramped up. Back in 2015, council had committed $1.25 million over 10 years to the construction of a new hospital. Forrester suggested the money come out of the funds council had already committed to the construction effort, as shifting the funds could free up more space for other grants. Councillor Lenny Epstein agreed with the move, which he said would change the conversation as council looked at the rest of the applications before them. Maynard disagreed with the tack. “Either we see fit to increase their allotment or we talk about this specific line and go with this amount or a reduced amount, but I’m not in favour of drawing that out of a reserve that we have just initiated because, to me, that serves no purpose,” she said. However, the majority of council supported the move. Subsequently, councillors took turns offering suggested reductions to the remaining grant requests. The reductions were considered informal and it was suggested the items would be discussed in detail later. When they reached the end of the list, a total of $44,000 was left above the budgeted grant dollars. While a $61.797-request from the University Hospitals Kingston foundation had previously been recommended reduced to $50,000, councillor Barry Turpin suggested the request be removed in its entirety for this year. The foundation had requested a total of $308,985 over five years and Turpin suggested that commitment could be pushed back a year as the Kingston hospitals redevelopment is a long-term project. Councillor Steve Graham supported the motion. He said the hospitals wouldn’t close their doors to county residents because the municipality was unable to support the project this year. “They’re not going to shut us out, it’s not going to happen,” he said. Councillors Harrison, Pennell, and Nieman spoke vehemently against the move. When it came to a vote, council supported the move by an 8–6 margin with Maynard, Nieman, O’Brien, Pennell, Forrester, and Harrison voting against. Following the vote Mayor Robert Quaiff suggested the remainder of the items be approved as is. Frustration seemed to reach a boiling point. Maynard said the move would be contrary to the outlined process. Ultimately, the majority approved the remaining grants. Grants that were approved were: $75,000 for the Prince Edward County Food Hub at Sophiasburgh Central School; $12,000 cash and $3,000 in-kind for the Prince Edward County Arts Council; $5,000 cash and $300 in-kind for the Prince Edward Point Bird Observatory; $15,000 for the Prince Edward County Chamber of Tourism and Commerce; $10,000 for the Community Development Council of Quinte; $6,000 for the Edith Fox Life and Loss Centre; $10,000 for Festival Players; $25,000 for the Regent Theatre; $40,000 for the Recreation Outreach Centre; $10,000 for The Hope Centre; and $2,500 for Volunteer and Information Quinte.